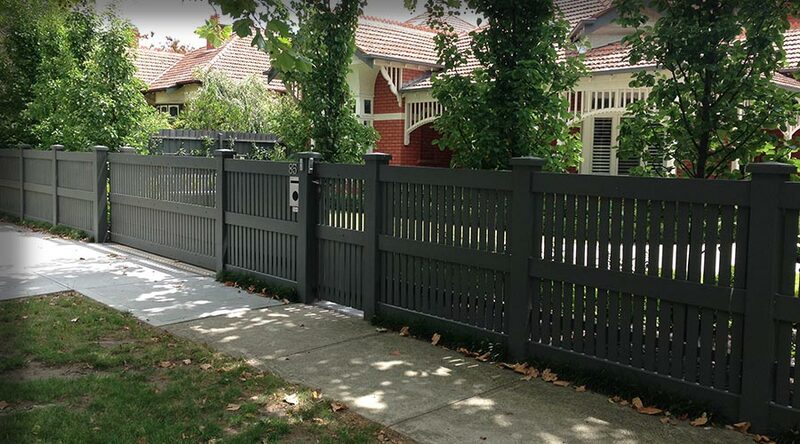 WHETHER THE STYLE OF YOUR HOME is Edwardian, Federation, Victorian, Californian Bungalow or a Modern design we can either work to drawings or help in the process of designing a picket or garden fence that is in keeping with the style and period of your home. 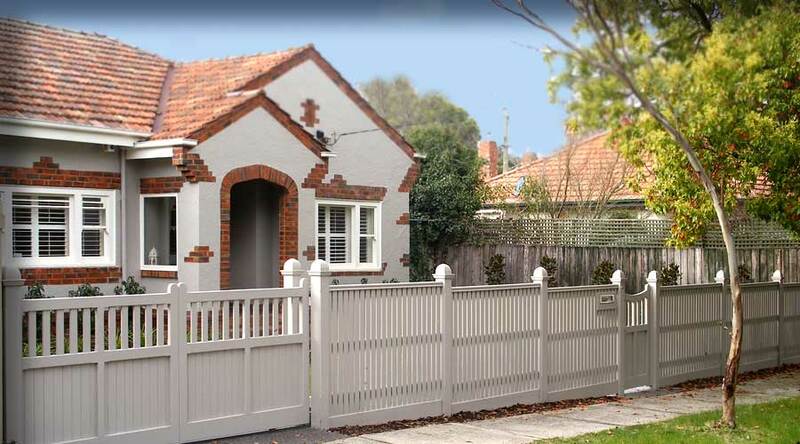 For self - builders, we can put together a fence kit to suit your needs and deliver to your door. 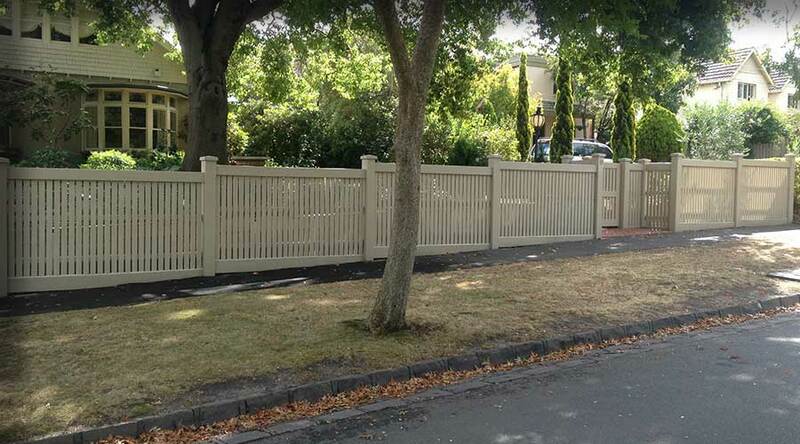 We can supply the finished posts and picket gates or feature gates, making installation as simple as possible, or supply the bare timber and gate frames so that you can create your fence according to our own design. 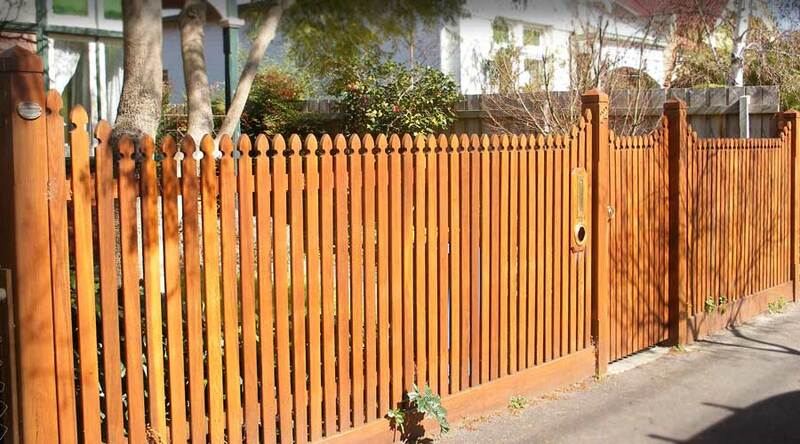 Below is our extensive range of fences which may help you in making your decision of what would suit your home. Please feel free to call us if your require any help. 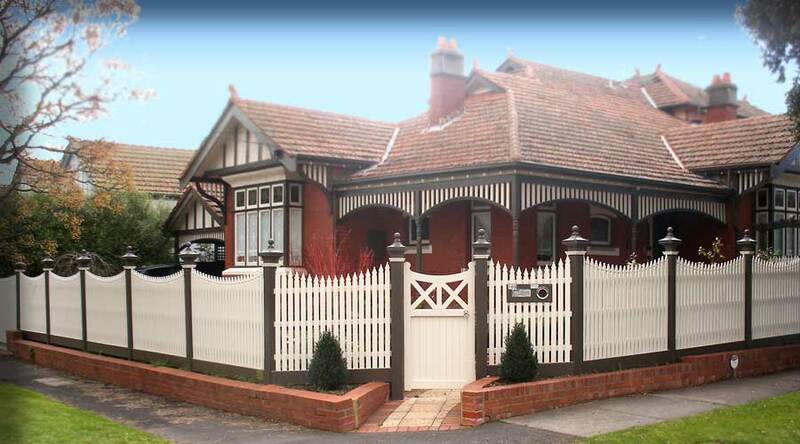 Special Convex picket design based upon historical photographs. 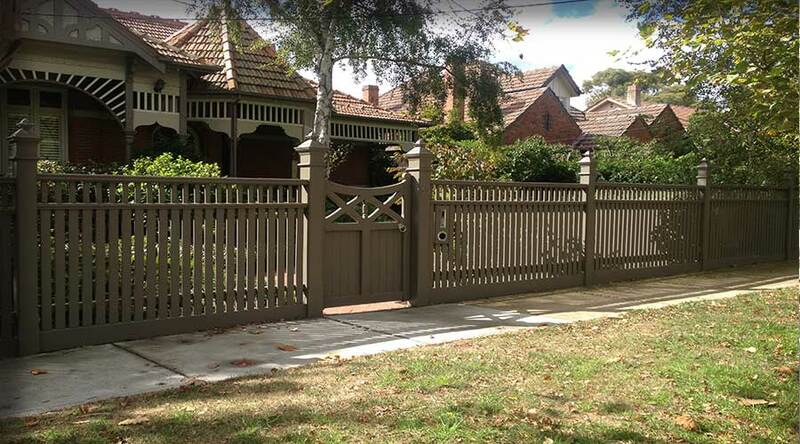 Also feature decorative Hardwood Feature Gate and entry arbour to side of property. 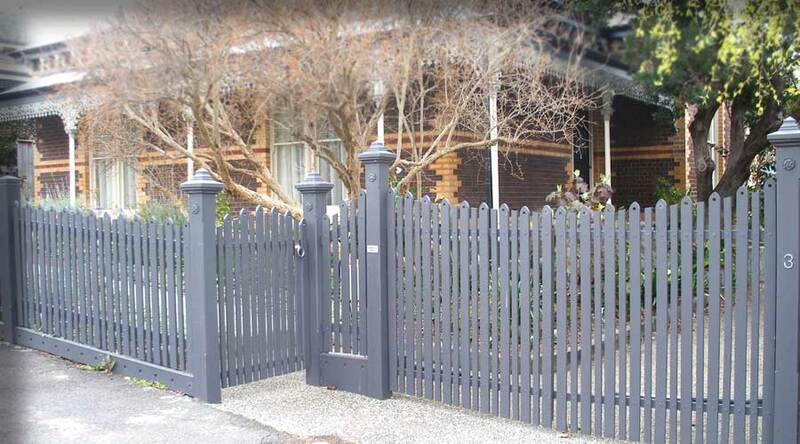 Staggered Picket Fence with recessed entries for vehicle and pedestrian gates. Design Feature 200 x 200 / 150 x 150 / 125 x 125 posts, decorative Scotia moulding and Angelina style Capitals and Hardwood feature gates. Federation design with C2 Capitals, Archboards, Recessed entry, No.7 Feature Gate, Pyramid Capping, & alternating pickets in 65 x 19 & 42 x 19. Level Top federation with No. 7 Post Top, Stonnington Capping and No. 3 Feature Gate. 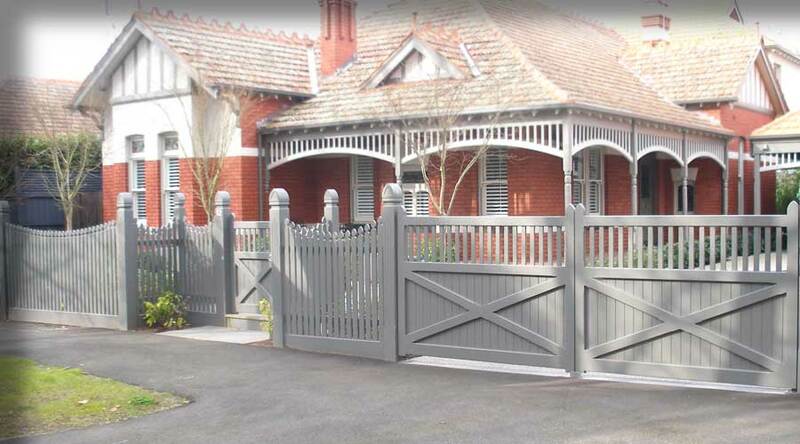 Stepped Federation design with No.2 post tops, decorative balustrades, & Stonnington Capping. 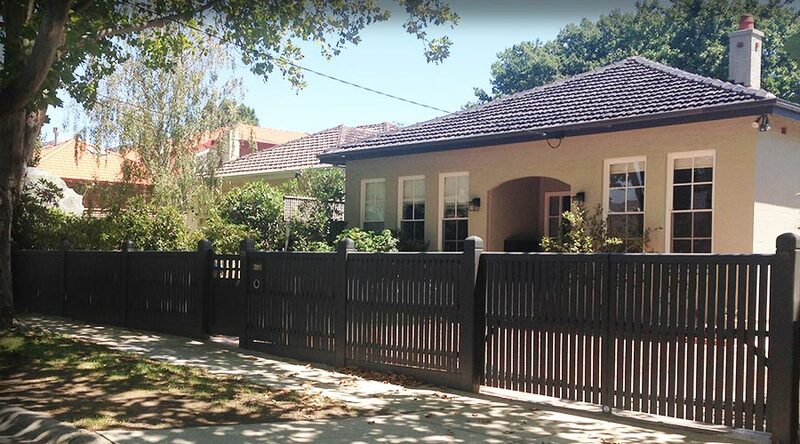 Stepped Federation with 150 x 150 posts & Victoriana Capitals, Stonnington Capping with Pedestrian & Vehicle feature Gates. 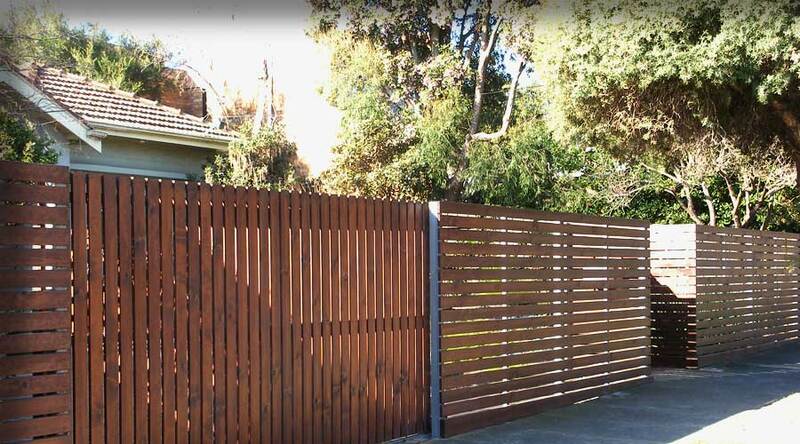 Fence includes Straight Top Configuration combining horizontal & wider Vertical Slats with Automated Sliding Gate fixed to a galvanized steel frame. 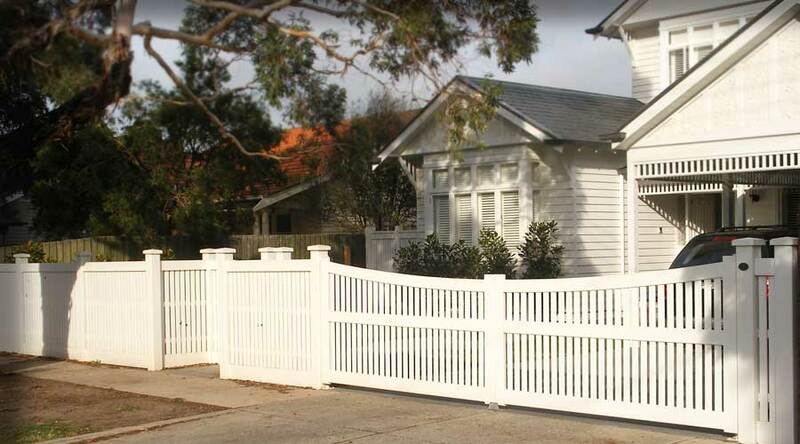 Step fence includes a Hampton Configuration with a Recess Gate, C5 styled Capitals and custom made swing Gate. Federation Middle Section Stepped Fence, Bannister Capping, Victoriana Capitals & Scotia Moulding. 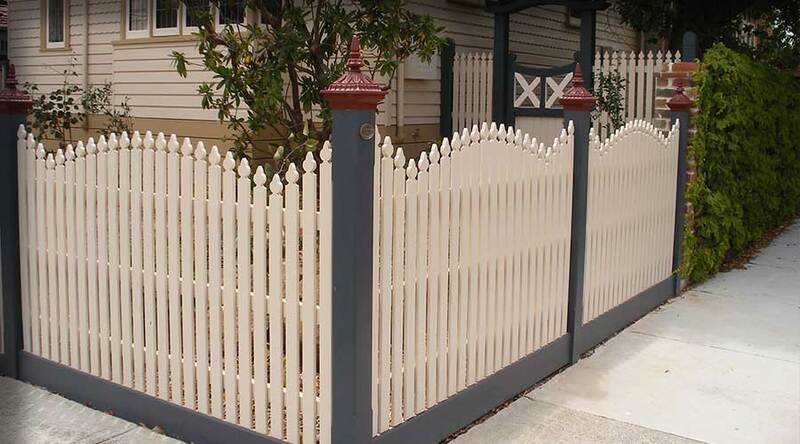 Combination 150 x 150 & 125 x 125mm Posts and Feature Gate. 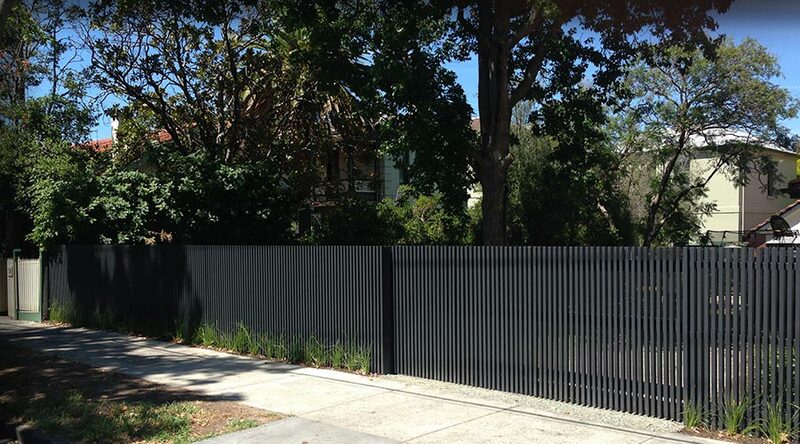 Contemporary fence in slim line pickets with a Straight Top Configuration and Gate with a driveway return. 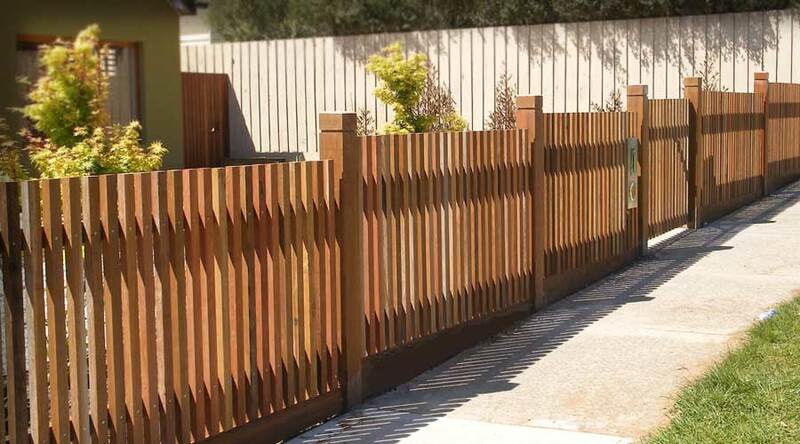 Fence includes Straight Top Configuration in contemporary natural finish 46 x 35mm Australian Hardwood. 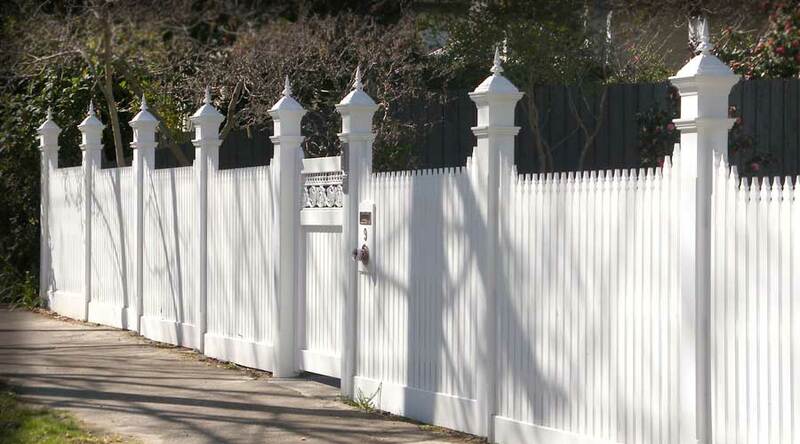 Fence includes a Concave Configuration with Pickets, Nicolina Capitals, Scotia moulding, No.5 Gate and Como styled letterbox. 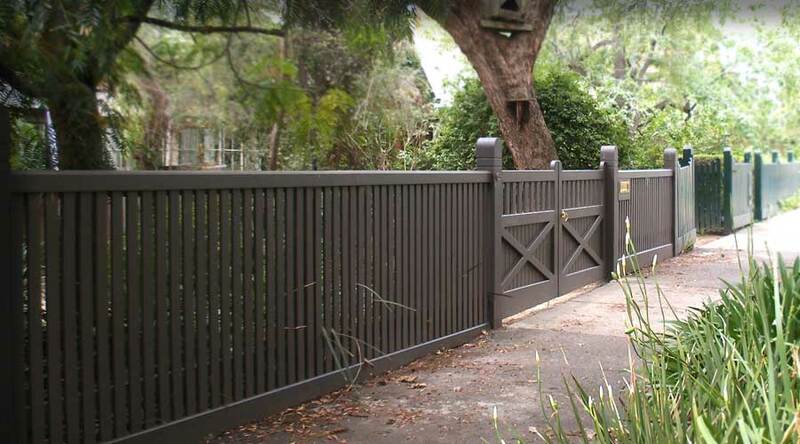 Step fence includes a Hampton Configuration with a Recess Gate, C5 styled Captials and custom made swing Gate. 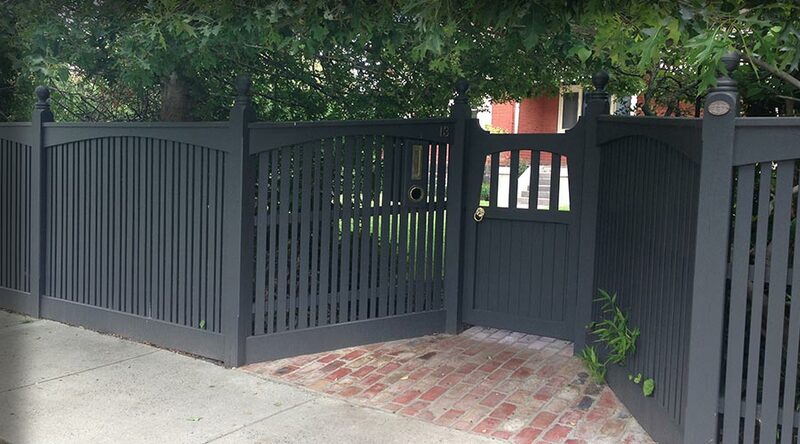 Fence includes a Concave Configuration, Recess Gate with 2-Way Steeple No. 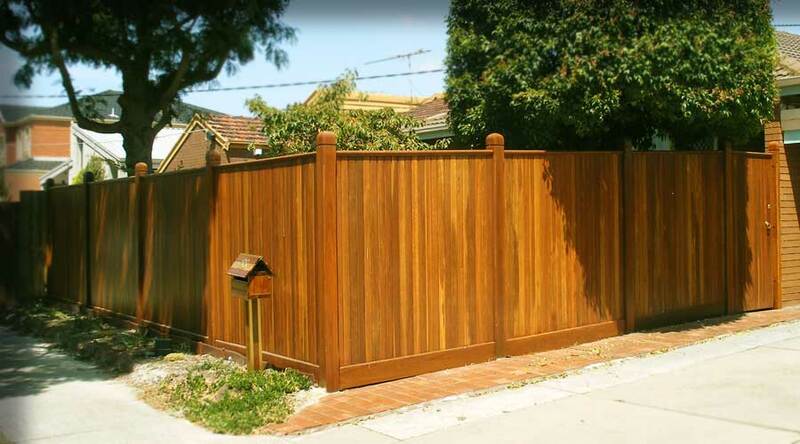 6 Posts with custom made Gates. 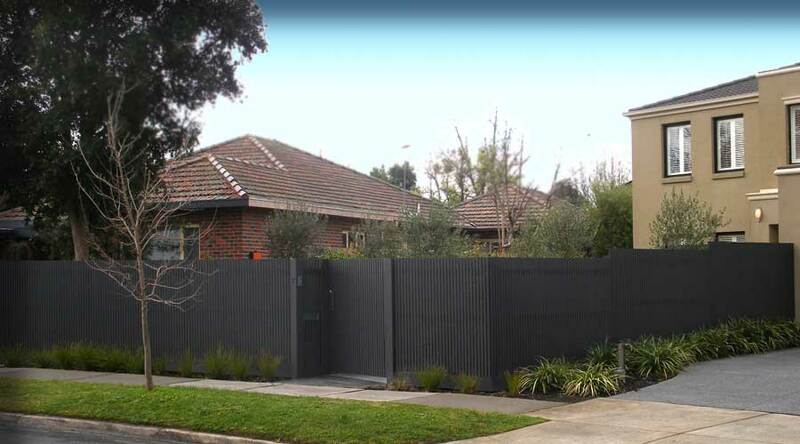 Modern shiplap timber fence coated with a natural protective coating and is also suitable for painting. Fence includes 2-Way Round No. 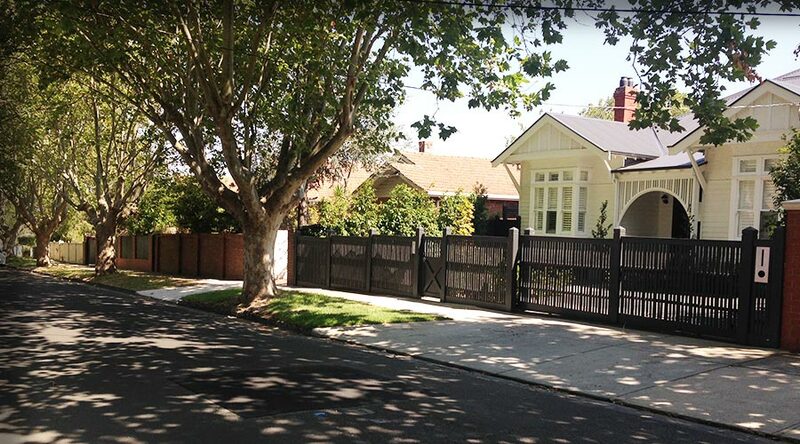 4 Posts, Stonnington capping and Armadale styled Letterbox. 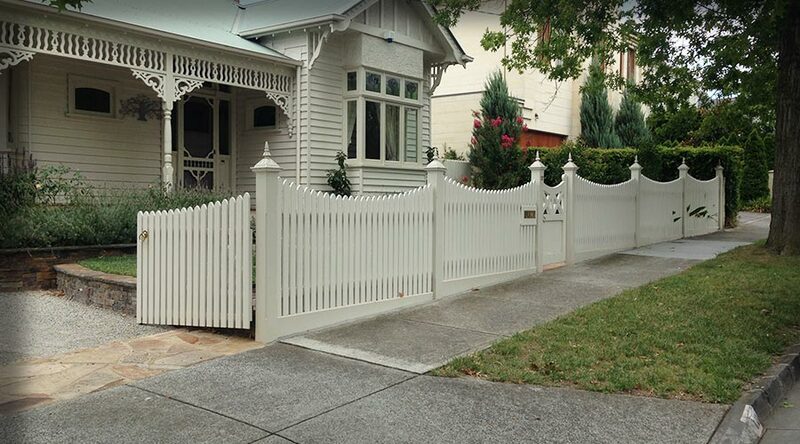 Fence includes a Rise and Fall Configuration with Pickets, Angelina Capitals, Scotia and custom made Gate. 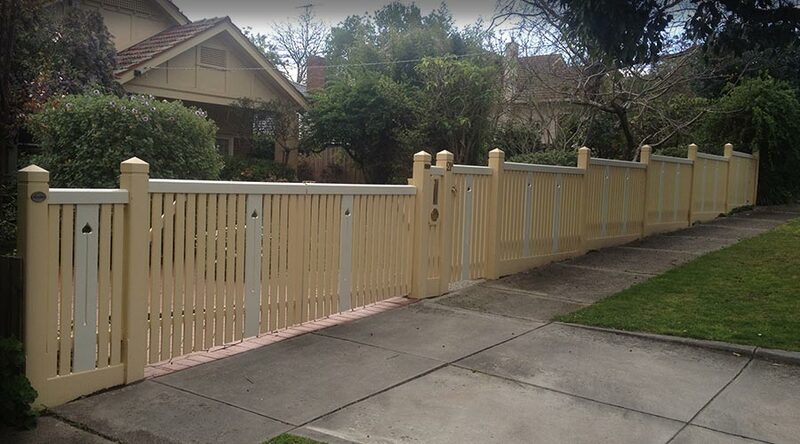 Step fence includes a custom sliding Gate, custom made Posts and Bannister capping. 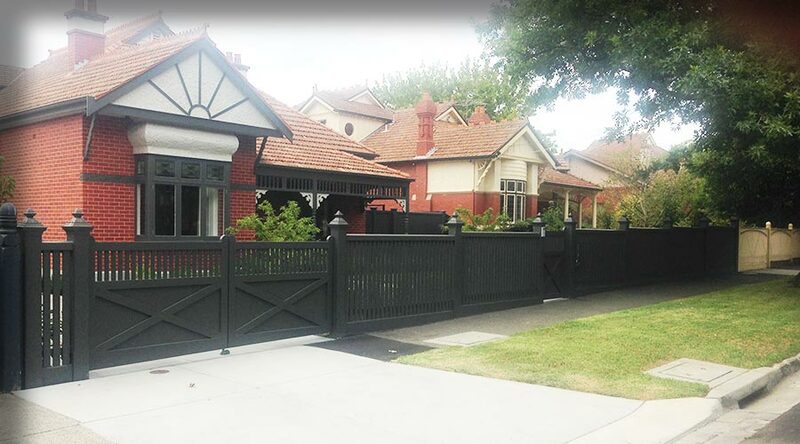 Fence includes Nicolina Capitals, decorative arch boards, Scotia, wide feature boards and Bannister Capping and Recess Gate. Fence includes Rise and Fall Configuration, No. 2 Post Top. Letteron style letterbox and coated in a natural protective finish. Fence includes Federation Middle Section Confirguration, No. 2 Post Top, Bannister capping, decorative Balustrade inserts and Windsor style Letterbox. 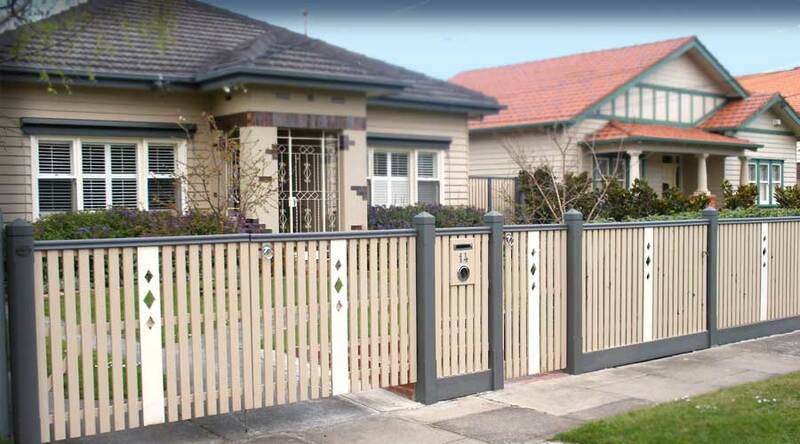 Fence includes Staggered Configuration, Special Capitals, post tops and pickets and Automated Swing Gates. 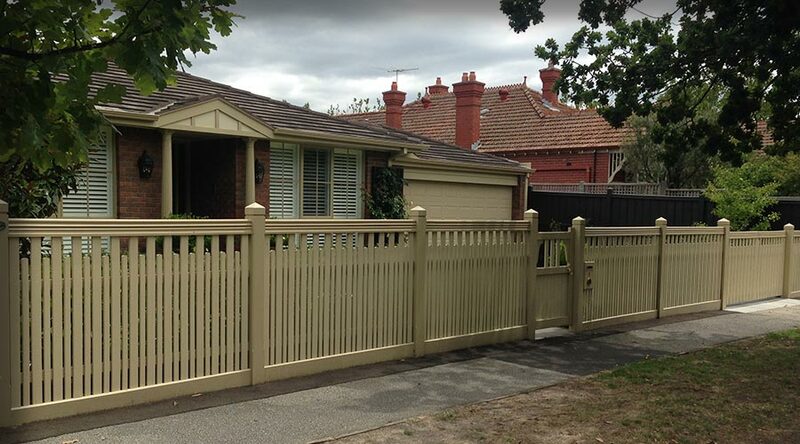 Level Top Batten design in 42 x 31 Hardwood with Concealed posts fixed internally to metal frame with Sliding gate. Stepped design with larger 150 x 150 posts with No.2 top, alternating pickets, pedestrian Feature Gate, Stepped Slider including post, & brushed stainless steel fascia letterbox. Modified Hampton including Sliding & Pedestrian Gates with brushed stainless steel fascia letterbox. Stepped One Up One Down Middle Section Federation – No. 2 Post Top, Bannister Capping & moulding, combined with Alternating pickets in 65 x 19 & 42 x 19. 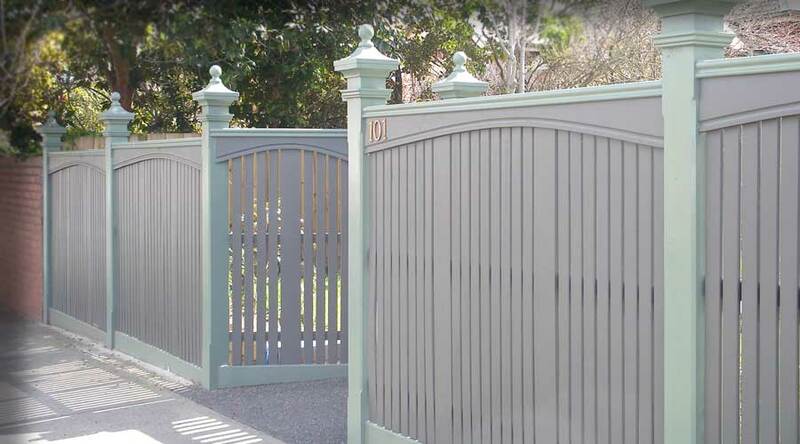 Stepped Concave design with Angelina Capitals, No.5 Pedestrian Feature Gate, & Armadale letterbox. 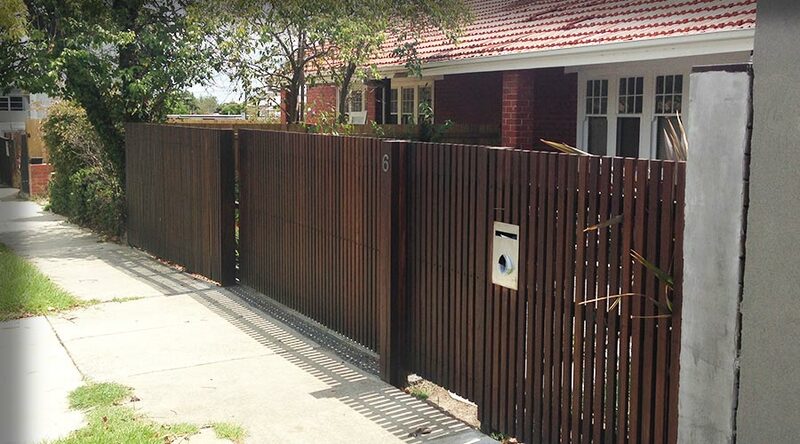 Level Straight Top Contemporary design with Concealed posts featuring 42 x 19 pickets, Sliding & pedestrian gates & 1 x Feature Post with brushed stainless steel letterbox.